1. How to Approach a Ghost Librarian. Or, Dr. Venkman gets busted. When Ghostbusters’ hapless trio of paranormal investigators confront their first ghost, wreaking havoc in the stacks and card catalogues of the New York Public Library, Peter Venkman’s approach is to break the silence of the library – loudly, wittily and flirtatiously. Against the better judgement of his colleagues, Stantz and Spengler, Venkman attempts to woo the ghostly librarian – one could say, to bring her to life. The disembodied, sexless librarian, complete with hair in a bun, pince-nez and silencing finger, is a classic figure of our anxieties about the dead hand gatekeepers of the archive: we see that calm demeanour turn feral when challenged by Venkman, the rage of the institution when it’s challenged to include other, louder, less conventional voices. This is one way that electronic voice phenomena enter the poetic archives: as a challenge, as a demand for change to a strict and astringent system. The voices are demotic, assertive, playful, alternative and alive, and they have no time for dead white rules about libraries (or poetic texts) being silently remanded to the page and the shelf. What if, however, the librarian’s only speech acts – her onomatopoeic vocalisations of a desire for silent contemplation and a rage when both personal space and an institutional social contract is busted – summon us to listen to silences, particularly to the absence of non-dominant voices in the archives. In another reading, this scene is an assault by three men on an older woman, a brash intrusion that denies the librarian her right to exist as a ghost, to read her chosen text in peace. “Shhhhhhhh” and “RAAAAAAAAARRRRRRRGH” are potent enunciations that subvert dominant ideas of verbal language. Onomatopoiea and embodied vocalisations are associated, in EuroWestern culture, with the Other: infants, “primitive” peoples, hysterical women. Verbal language is written into our culture as a marker of belonging. The ancient Greeks called the Persians “barbaroi” because they spoke improperly to their ears, saying “ba – ba – ba.” Anne Carson talks in The Gender of Sound about the association, going back to Aristotle, of female or feminised speech with nonsense and gossip, but also with aggravating, or even destructive, high pitch and tone. In the 1960s feminist vocal performers embraced this barbarism (via its Ubu/Dada tradition from earlier in the century) in order to both challenge and utilise the charge of its association with primitivism and the occult. Yoko Ono was literally called a witch by monomaniacal music fans exhibiting ingrained sexism and racism, as well as their fear of her challenging non-language and vocal dynamics. Laurie Anderson, at the other end of the pitch spectrum, used technology to transgender her voice and performance: the late Lou Reed named her moustachio’d performative persona Fenway Bergamot. Her very competence with technology challenges gender norms. Diamanda Galas similarly developed a unique multi-miked, performer-controlled system to enhance her three and a half octave range stretching from Anderson’s growls to Ono’s shrieks; in an eldritch gesture, she appropriates glossolalia on Plague Mass, as part of her critique of the Catholic Church’s criminal negligence towards HIV/AIDS. The RAAAAAAAAARRRRRRRGH screams into a void of silence, challenging finger-to-lips gatekeepers just as Venkman does. But there is also a concomitant Shhhhhhhhh – a demand for a contemplative hush ‘capable of being in uncertainties, Mysteries, doubts, without any irritable reaching after fact and reason,’ as John Keats famously defined negative capability. The Last Silent Movie (2007), an installation by artist Susan Hiller, returns to the voices haunting the ether 20 years after her Magic Lantern (1987) juxtaposed a soundtrack edited from the Raudive EVP archives with a 3-channel projection of pure colour slides whose Venn diagram-like intersections produce hallucinatory after-effects similar to the auditory hallucinations of verbal language in Raudive’s recordings. Like that earlier work, The Last Silent Movie makes a multimedia demand on its audience: to look and listen. The title of the piece suggests we know how to receive this phenomenon: as a movie, an audiovisual display. But, as in Magic Lantern, sound and image pull against each other. In fact, the catalogue describes it rightly as neither silent nor a movie. The Last Silent Movie is composed of twenty-four found texts, each in three parts: an audio excerpt of a recording from an official (academic or institutional) archive such as the Library of Congress; a series of black film frames with intertitles naming the (dual: institutional and individual) origin and subtitles translating (where possible) into English the voices on the audio; and an etching, hung separately from the screening room, featuring an English translation and a waveform of a phrase from each recording. The recordings, as Hiller says on her website, draw from ‘the unvisited, silent archives of extinct and endangered languages to create a composition of voices that are not silent. They are not silent because someone is listening’. In some cases, such as Kulkhasi, a language from South Africa, the recordings are of a monolingual last speaker, with no translation possible. The silence of the installation’s title is not only the after-effect of genocides and cultural homogenisation, but that which is disrupted by these speaking voices – often speaking of injustice and oppression. ‘We learned to hide our language and our secrets,’ states the etching representing Jiwarli, a language from Western Australia. The installation, thick with both elegy and irony, both “Shhhhhhhh” and “RAAAAAAAAARRRRRRRGH,” is only possible because of the anthropological culture it’s critiquing. Its work of profound mourning and equally profound critique that reminds us no electronic voice phenomenon is innocent: all voices have an address and an addressee. Caroline Bergvall’s Noping (2013) is an installation and digital multimedia poem, produced and published by Triple Canopy. 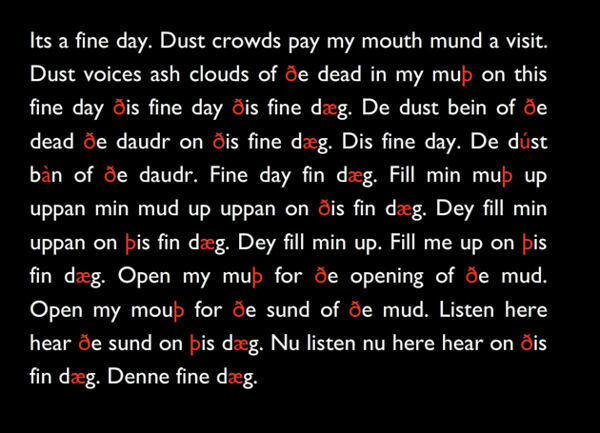 Consisting of an integrated combination of text screens, digital audio and video, it’s part of Bergvall’s work on the echoic languages within English and Danish. Here, she looks at the relation of Icelandic to Old English and Norse through its unique retention of two additional alphabet characters, thorn and yog. She focuses on thorn, which looks like a lower-case p with an upper extension of its spine and survives (silently) in English as the consonant combination th. Bergvall translates this visual “tripping” into an aural trip, (mis)reading the group of English words formed from prefix + thing as prefix + ping. So both objectivity and materiality, the whole world of substance (and its absence in nothing) is transformed into an etherial voice phenomenon. Ping is multiply a term for electronic communication: onomatopoeically it is the word for the dominant sound (and affective prompt) of cellphone and email culture, the “ping” that alerts us to the voice reaching out to us through the ether, demanding our listening or interaction. In blogging terminology a “pingback” is a record of citation: that is, someone has heard, and indeed amplified (by reposting), your etheric message. Technically, a “ping” is used to test broadband quality and speed (both bandwith and latency), a small electronic signal sent out like a radar, in order to time the bounceback and assess how long it takes for packets to reach a host. To have “noping” is to be outside digital culture, to be unavailable to electronic voice phenomena. That can be punitive, as a result of asymmetric economics and access, as well as desirable. As for the ghost and the ghostbusters, and for the Jiwarli speaker and the anthropologist seeking to record his speech, silence – as an electronic voice phenomenon – is as significant and as contested as speech. Like a ping that never reaches its recipient, the thorn is not nothing/noping: its absence is made audible in Bergvall’s intervention. Searching for “ping” on the Archive of the Now produces a series of found visual poems that draw attention to ping’s connection to only one part of speech in English. Apart from “impinge” and a few place names, “ping” appears only as the final syllable of present participles of verbs whose infinitives end in ‘p’. Gertrude Stein famously invoked the present participle, or gerundive, as her preferred poetic form, calling it (and calling for) a “continuous present.” Blurring verb and noun, this p/ing keeps resounding, summoning the nowness that is the most uncanny element of EVP. For Konstantin Raudive, electronic voice phenomena were the claims of past on present, of the excluded Other on the self. Call that prayer, poem or ping, it calls us to listen – and, as poets, to keep pinging, whether anyone answers or not. Sophie Mayer is currently Poet in Residence at the Archive of the Now. Her most recent collection is songs of the sistership (Knives, Forks and Spoons, 2013), a collaboration with Sarah Crewe.